The Weight: You simply can’t write a review about this pack without mentioning the weight. At 24 oz, it is one of the lightest framed packs made. This is obviously a huge advantage. When you put this on your back without anything in it, you can’t even tell you’re wearing anything! Lowering pack weight was very important to me on my PCT thru-hike, and getting a pack that is practically weightless was a good first move. Customizability: While some will be annoyed that an already expensive pack has barely any “bells & whistles” like hip belt pockets, and must pay more for these add-ons, this is the way of the business. I appreciate being able to select the extras that I really want on a pack. For mine, I chose a shoulder pouch, 2 hip belt pockets, a lumbar pad for extra cushioning, ice axe loops, and a V-strap top closure. There are other options too: water bottle holder clip, a 4-in-one backpack top lid, key pouch, top side pockets, trekking pole holders, shoulder strap pads, etc. These after-market accessories are nice for many reasons: in case you break an attachment, you can buy a replacement. If you realize you want to add on another accessory after using the pack in the field, you can buy it and it’s easy to add on. The hip belt itself can be removed and swapped for a larger/ smaller size if you’re sharing a pack or gain/lose weight. All changes are easy to do yourself, too. Adjustability: Another surprising feature of an ultralight pack: it’s highly adjustable. The hip belt has a dual tightening system with a bottom and top pull, which makes load transfer more comfortable, and you can fiddle with it throughout the day to put more/ less weight on your hips. The shoulder straps can be moved up and down to ensure a comfortable fit. This pack also comes with load lifters, so you can pull heavy loads closer to your body. The roll-top closure allows you to roll down the pack tight as you eat food during a trip. And the main differentiator from other UL framed packs: The Arc! This adjustable arc-frame keeps the backpack lifted or, “arc-ed”, away from your back. This helps comfort: you won’t have a heavy, sweaty pack trapping more heat and sweat against your back. It allows for air flow, which was amazing, because most days on trail are warm-hot, and back sweat is real. Size: For an ultralight pack, this thing is roomy! The main compartment is 49 L, with each side pocket being 2.5 L, and the back mesh pocket 8 L. I had more than enough room for all of my gear on my thru-hike. In fact, my base weight gear sat in the bottom 1/3 of the pack and in the outer pockets. The rest of the room was taken up by food! This pack can also fit a BV500 bear canister (vertically), one of the largest on the market. Not to mention, if you add on belt pockets, each one of those has a capacity of 1 L, aka enough room for all of my hiking snacks on a typical day. 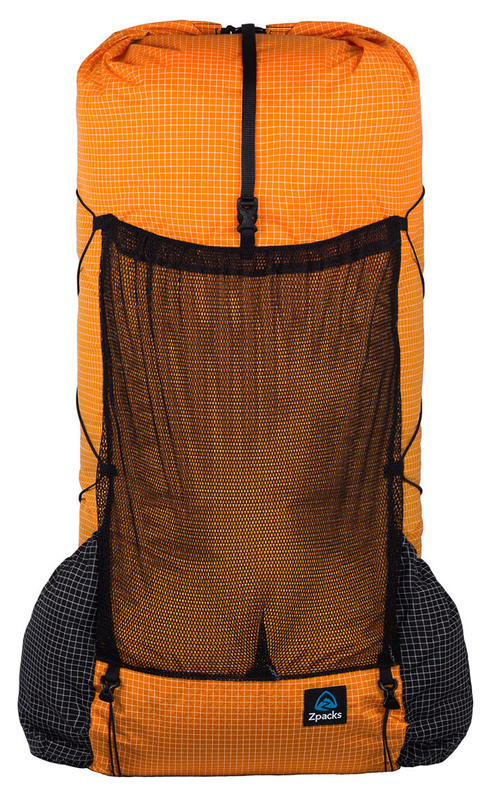 The back mesh pocket is really handy for storing things you don’t want to dig around in your pack for: rain gear, bathroom kit, etc. And is good for storing wet gear that you don’t want to put in your pack. The Fabric: The Gridstop fabric is pretty tough. There were times on trail where the brush was really overgrown, and definitely times where I brushed against barbed wire in the desert, and there was no damage to the body of the pack. The material is also highly water resistant, and ZPacks seals all seams on the pack. I still keep my gear that absolutely must stay dry in a pack liner, but I wouldn’t hesitate to not bring a liner on a trip that wasn’t going to see any rain. Even through days of rain in Washington, the inside of my pack was always dry, and I didn’t use a pack cover. The material itself wets out, but in my experience, the water didn’t soak through. I’d always use a pack liner though, if bad weather is a possibility. Design: I like the simplicity of the pack. For a thru-hike, simplicity and ease of use is crucial. Granted, I did need to purchase add-ons to make this claim. But the size of the hip belt pockets and having the shoulder pouch made it so I really never had to take my pack off during the day. Everything I needed was literally right on me - in the belt pockets or shoulder pouch, or in the side pockets. I kept my phone, knife, sunscreen, body glide, bug spray, and chapstick in the shoulder pouch. In my left pocket, all of my snacks for the day, and in my right pocket, my Sony a6000. On my right shoulder, I was able to hook my Garmin inReach onto the daisy chain webbing. The side pockets are designed very well. Its so easy to get a water bottle into and out of the side pockets, which is crucial for me. Comfort: Overall, the pack is comfortable. BUT, it really is not in a few circumstances. I did not care for carrying a bear canister in this pack. I wasn’t able to position it in a way where the weight felt well distributed. It also does not feel good carrying more than 4 days of food. I guess I should put it this way: If you’re loading the pack over 30 lbs, I don’t think its comfortable, even though the rating is 40 lbs. I think the pack can handle loads of up to 40 lbs, but it certainly won’t be comfortable. The sweet spot is 20 lbs and under, which I generally get to experience the last 2 days before getting to town to resupply. On days where my pack was really heavy, it was mostly painful on my hips, and I would adjust the pack to carry a little more weight on my shoulders so my hips wouldn’t scream in pain. I should note that they wouldn’t start screaming until I hiked about 10 miles at the top weight, but that might only be me & my body. A good transition pack from brand-name framed packs to the cottage industry. Weight: 24 oz. with no added accessories. I was very happy with this pack for my PCT thru-hike. I do want to mention though, that there were some people I chatted with who had failures of this pack, or didn’t like it so much. With these complaints, it’s hard to accurately assess how the pack was treated and how much weight was regularly being carried in it. This is a true ultralight pack, and should be treated as such: packing the smallest, lightest kit you can muster inside of it, and treating it gently (i.e. don’t sit on it, don’t throw it around, don’t pick it up by random straps, etc.). I think overall, if you know what to expect from the pack, and what the limitations are, this would be an excellent pack for a thru-hike, or for UL weekends.